It’s this struggle that Ziegler focuses on, and she makes us feel it keenly. We cringe every time the mature and learned Dr. Franklin is addressed by her backbiting colleagues as “Miss Franklin.” But there’s something else going on here as well, the suggestion that it was this prejudice alone that resulted in her not being the first to win the DNA mapping race. Does Ziegler want us to be convinced of that at the play’s end, or is it simply that Franklin’s pride was the block to success? Elizabeth Rich, Michael Glenn, James Flanagan and Clinton Brandhagen in Theater J's "Photograph 51." Photo credit: Stan Barouh. The play follows the work of two English laboratories on the hunt for the map of the DNA molecule’s structure – sometimes competing, sometimes working together. Franklin endures the stiff-upper-lip machismo of her scientific partner Maurice Wilkins at the Cavendish Lab, while at Kings College Francis Crick and James Watson are able to work more closely together despite different backgrounds and temperaments. They also may just be more cut-throat. Director Daniella Topol guides a fine cast through the action, keeping the jumps through the time vortex and shifting voices of the scientific chorus cleanly delineated. They’re led by Elizabeth Rich as Dr. Franklin, whose strength is either a blessing or a curse. Rich keeps the enigma of Franklin’s persona intact, so that her inner life is just out of reach to us, glimpsed but never known. It’s an intelligent, thoughtful performance that’s the touchstone of the production. As her research partner (or adversary, depending on how you look at it) Dr. Wilkins, Clinton Brandhagen is so rigid in his inability to see past her femininity you want to punch him. James Flanagan and Michael Glenn, as Watson and Crick, have a lot of fun playing off each other and at times this manic energy threatens to push things a bit off-kilter. Were the Kings College duo really so Machiavellian in their pursuit of the prize? I’m not sure, but Ziegler’s chooses to give us that version. As the conscience of the play, Tim Getman’s bright-eyed Don Kaspar really makes us feel the slights Franklin suffers, in just one heartfelt scene where the long-time admirer from graduate student to fellow scientist reacts to his idol being condescended to as “Miss.” That one wordless moment says it all. Ziegler starts to explore a romantic relationship between the two, only to have it cut off mid-hand-holding by the first pangs of Franklin’s ovarian cancer. It’s an awkward transition that felt too forced. It seems an unnecessary plot device, an attempt to warm Franklin up, and I preferred the scenes where the two communicate their intellectual admiration through reading their correspondence. 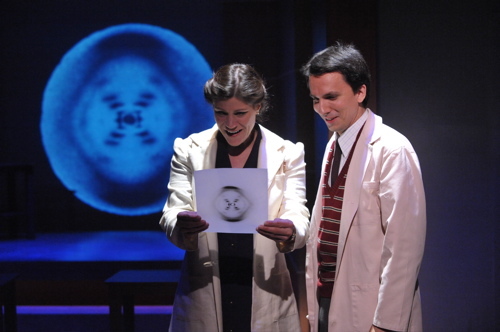 There are some truthful moments that the production does its best to mine, such as the loneliness and grueling toil of scientific research, and also its danger ,as Franklin’s cancer seems linked to her x-ray work. There are also a lot of unanswered questions – was the misogyny of the 20th century scientific community the reason Franklin didn’t win the race? Was it her own pride and inability to find a way to compromise with Wilkins that was the cause? Both? Neither? The play does a serviceable job trying to tease out these themes, but it’s not imbued with the same enigmatic depths as its subject. 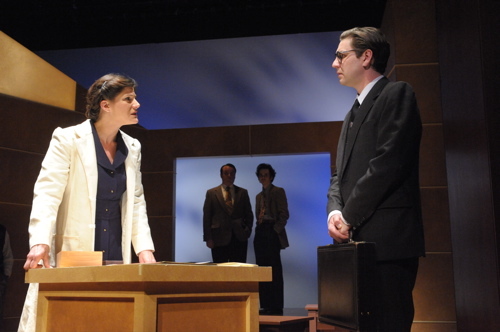 Photograph 51 runs at Theater J through April 24. Theater J is located at the DCJCC, 1529 16th Street NW, Washington, DC 20036. Closest Metro stop: Dupont Circle (Red line). For more information call 202-777-3230.